Admitting the dangers of pseudo-working has helped me focus and get more writing done in less time. See if it will help you too! When I used to juggle multiple tasks at once, I’d tell myself I was multitasking. It was a lie. I was switching from one task to another and forcing my brain to work twice as hard to shift, reorient, engage, and repeat. Pseudo-working looks like work, but it doesn’t produce much at the end of the day because I’ve expended most of my energy in the act of switching tasks. You don’t have a time problem if you are pseudo-working. You have a distraction problem. By framing it as a time problem, you’re giving yourself an out. “But I spent two and a half hours looking for a name for my character!” No, Mavis, you spent a total of twelve minutes searching for a name in between two hours of social media, a phone call to your mum, and fourteen text messages. I’m speaking to myself here: stop believing the lie. 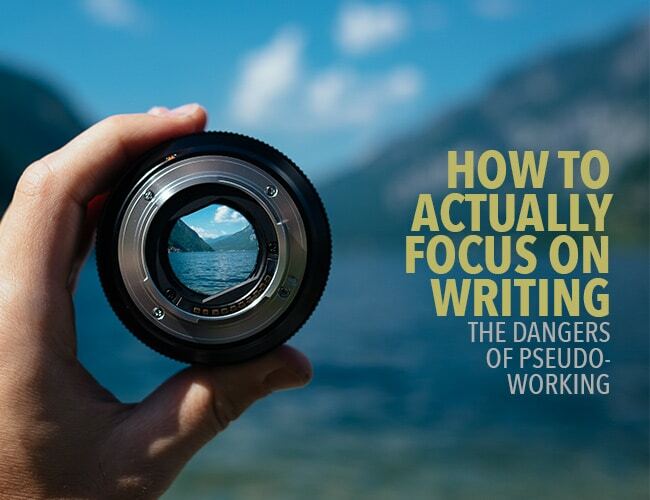 Focus on writing or don’t, but stop getting caught in the pseudo-working cycle. Okay, so pseudo-working doesn’t work. But how do you break the cycle and actually focus on writing? Here are two strategies I use. If you’re ready to stop pseudo-working, first, evaluate your work habits. As I evaluated my own habits, I had to get honest about how many times I switched screens or glanced at my phone while I wrote. I had to admit to myself that each time I “checked” something, I lost time and momentum. If you’ve realized that you pseudo-work often, set a small goal for yourself and get focused. Set aside fifteen to forty-five minutes and focus on writing solely that single project. Put your phone in another room, shut off the wifi and block your access to distracting sites, and write until the time is up or your goal is met. Track your progress and see what produces the most work. You may find it’s more effective to schedule short focused bursts that eliminate distractions than to plan long extended periods where you’re interrupted often. It isn’t easy to conquer the temptation to pseudo-work. With practice though, we can overcome distractions and get more writing done in the year ahead! How often do you pseudo-work? What tricks do you use to focus on writing? Share your experiences or best tips for beating distractions in the comments. Right now, focus on writing for fifteen minutes. Set aside your phone. Close all those tabs you have open to your favorite social media. Pull out a pen and paper and shut yourself in your closet if you have to. If you have a work in progress, continue writing it. Or, try this writing prompt: Jackson hears a crash in the next room. When your fifteen minutes are up, share your writing practice in the comments below. Were you able to focus on writing? How hard was it to fight distractions? The post How to Actually Focus on Writing: The Dangers of Pseudo-Working appeared first on The Write Practice.